Until I went to buy them! I found a 900 Hot Metal SW that completely matches my irons... Same shaft, 1" extra long... It even has a jumbo grip on it already, though I'll probably change it to match the rest of the set. It should arrive Thursday or Friday of this week. (EDIT) Got is, love it, can't wait to play it on Monday! JPX 919 Tours PX LZ 6.5 looking to hit the ball even straighter! 919 tours with nippon 120 stiff and s18 wedges 50 55 60 with same shafts. Was going to order the driver but the Cobra f9 was fantastic on demo. I like the changes they have made to sole width and blade compared to 900 a Tour which were excellent. Expecting a lot from these beauts!! Hopefully , provided we don't freeze to death well have some good reports after the weekend games! Yes liked the modus 120s , very very strangely hit my friends 105s in 900 a Forged very well, but really enjoy the LZ s. I picked up a TS 3 Driver also, but do like the new Mizuno offering, just I have so many Titleist shafts at home it would be a bit of a culture shock switching to anything else! All the best for the weekend! Stay warm gents! Ive probably added around 2-3yds of carry per club but more importantly, managed to lower the spin but increase the height of the flight. Got masses of stopping power with them, even getting instant grab with a 4i at 212yd carry. On the flight scope my average apex across the board with them is 106.6ft!!! average apex across the board with them is 106.6ft!!! Nothing better than instantaneous advances / improvements. They are also so easy to shape it's a joke. I'm happier that mizuno have slightly flatter lies as standard as some manufacturers are far too upright, which discourages proper arm rotation. Irons off the hook this am like lasers, TS3 long and straight first competition if the year , 65 gross, very happy with changes made! 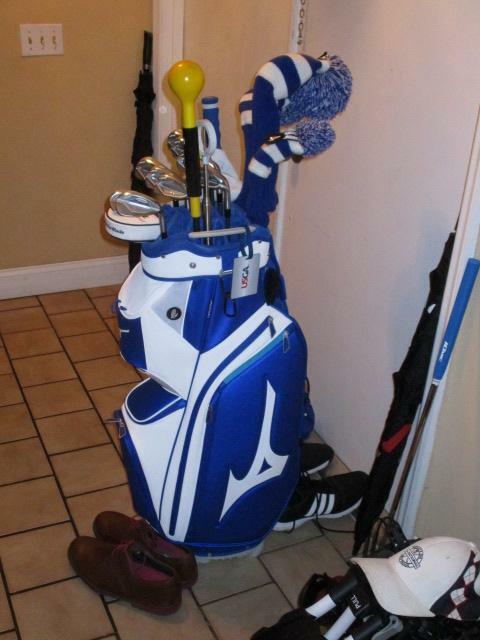 I bought a new golf bag. I've been using a Mizuno stand bag and it's gotten torn up over the years, not to mention I had it in the front yard one day as I was unpacking the car and tripped, fell against it and bent the metal springs on the stand, so it was crippled. This new bag has more pockets than I honestly know what to do with. Just ordered a pair of the Nexlite 005 Boa's from an UK vendor. I have the spikeless version that I bought on Ebay a while back that I love, so I'm looking forward to getting the soft spike version!! I just ordered The Premier Card. Long story short, it's something you pay $59 for and for about a 7 month period, you get deep discounts on about 40 golf courses in Miami, Ft. Lauderdale and a few up into the Palm Beach area. There aren't many in Miami, but one is near me and I do have a bunch of friends in the Ft. Lauderdale area who play, so I'll probably drive up there a bit. It includes Inverrary, where the Jackie Gleason tournament used to be. It includes Palmetto Preserve and Jacaranda, quality courses that are semi public and where they make you feel like a member of a ritzy country club when you are there. Doral Silver used to be on it, but some politician decided that had to end. I just bought one of the ST180 drivers. I like my EZ driver, but the ST was simply too good a deal to pass up. I was actually looking at the ST190, but I'm not sure my game is going to see much difference between the two for the moment. Must be pick up a Mizuno bargain day to day...! I need to call Mizuno in Atlanta tomorrow to find out whether the EZ adapters I have will fit the ST180 driver. If the adapters fit, I'll grab it. I have senior flex shafts in everything right now, but I'll be getting the regular flex shaft in the driver. With both shafts, (if the adapters fit), I can test each one at my local golf shop and find out which performs best for me. My new ST180 3 fairway wood arrived today first class service at a great price...! I went ahead and bought the ST180 3 wood too. The good news is... I called Mizuno in Atlanta the other day. I asked whether the adapters on my 2016 EZ driver and 3 wood would fit the newer ST180 and they told me it would. Now, once the new clubs arrive, I can test the regular flex shafts versus the senior flex shafts I currently have and determine which is better for me. The driver is supposed to arrive today. The 3 wood is due the end of the week. That's good news Dennis that they will fit the new clubs, hopefully that should save you further expense having to buy new shafts...! It was the 5 wood that arrived today, the EZ that I initially bought to fill in the gap between the 3 wood and 4 hybrid. The driver is apparently due tomorrow. I've decided to call my friend Derrick Payne, a local pro I worked with for a few years. I need someone to set me up and help with some tips to create a consistent new swing. Part of that will be a test of the shafts on his computerized gadgets.